Armstrong Siddeley introduced the 18 horse-power car in 1921 and the first full year of manufacture was in 1922. In many ways, the 18 HP car was a scaled down version of the 30 HP with similar body styles and design characteristics. The engine was half the capacity at 2.4 litres, compared to the 5 litres of the 30 HP car; and the length and height were shorter with a wheelbase (distance between axles) of 3.05 metres (10 ft) compared to the 30 HP’s 3.43 metres, and overall length of 4.19 metres (13 ft 9 inches) compared to the 30 HP length of 4.99 metres. The company made the Mark One 18 HP car through to July 1925, producing 2,126 cars in total. 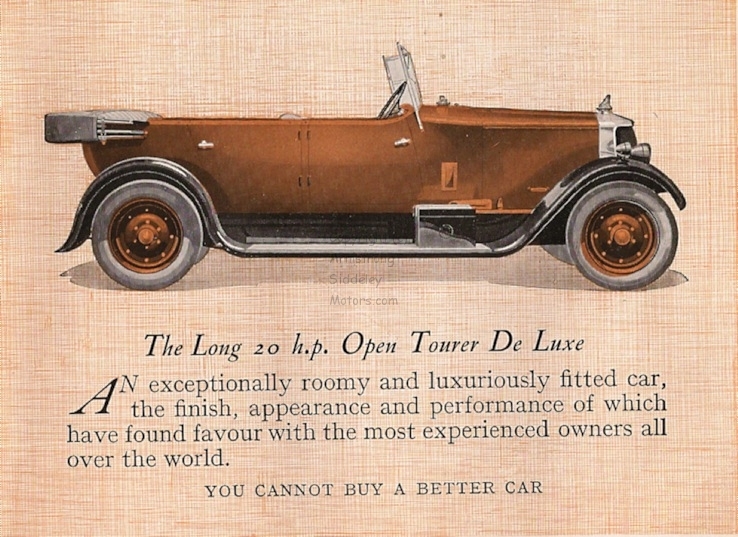 The most popular body design was the tourer and nearly three times as many tourers were sold than the enclosed landaulette, which had an opening leather hood at the rear. The rest of the production was made up of limousine, saloon limousine and saloon landaulette cars. Armstrong Siddeley introduced the Mark Two 18 HP in 1925/6. 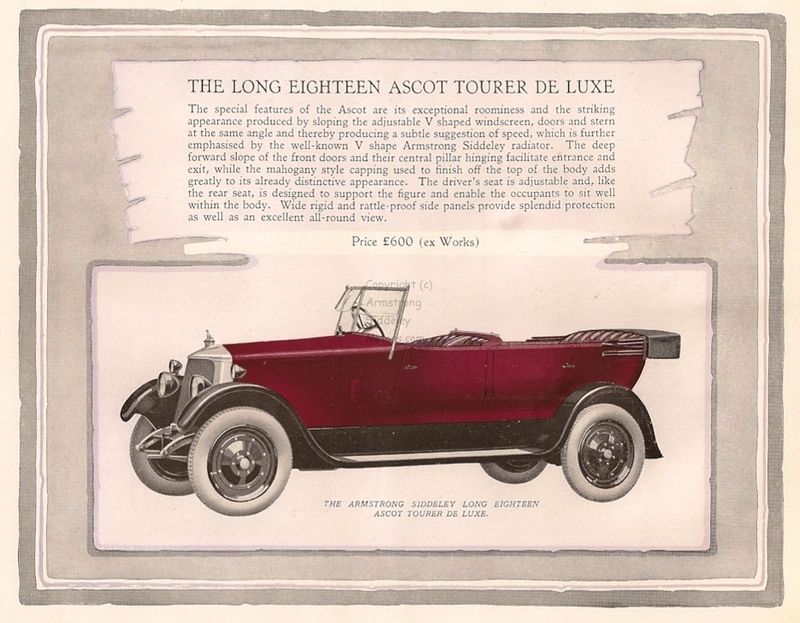 Initially in 1925 the company lengthened the old chassis but in March of the following year Armstrong Siddeley introduced a new 18 HP chassis and much revised engine with an increased cubic capacity of 2.9 litres. There were two versions of the Mark Two 18 HP, the Short 18 and Long 18. The new engine was rated for tax as a 20 horse-power car and from 1927 Armstrong Siddeley called the two models Short 20 and Long 20. The company continued making the Mark Two 20 HP through to 1931. The company made 6,641 Mark Two 18/20 HP cars in total. The short chassis car was much more popular than the Long 20 and made up three quarters of the total production. The short-chassis car was lower in cost and would have performed better than the long chassis when fitted with the increasingly popular and heavy saloon coachwork. A much revised new 20 HP car was introduced in 1931; the new Short 20 had improved specification and performed well. 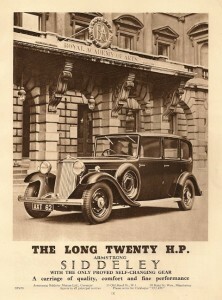 The image above is taken from an Armstrong Siddeley advertisement of 1928. The lovely Art Deco illustration of the 20 HP is by the well know illustrator Bryan de Grineau. The aeroplane in the sky is a reference to Armstrong Siddeley aero engines. Below is the Long 18 horse-power Armstrong Siddeley from a catalogue published around 1926. The body shown is the Ascot Tourer which was probably made by Burlington coach works, Armstrong Siddeley’s own coach maker. 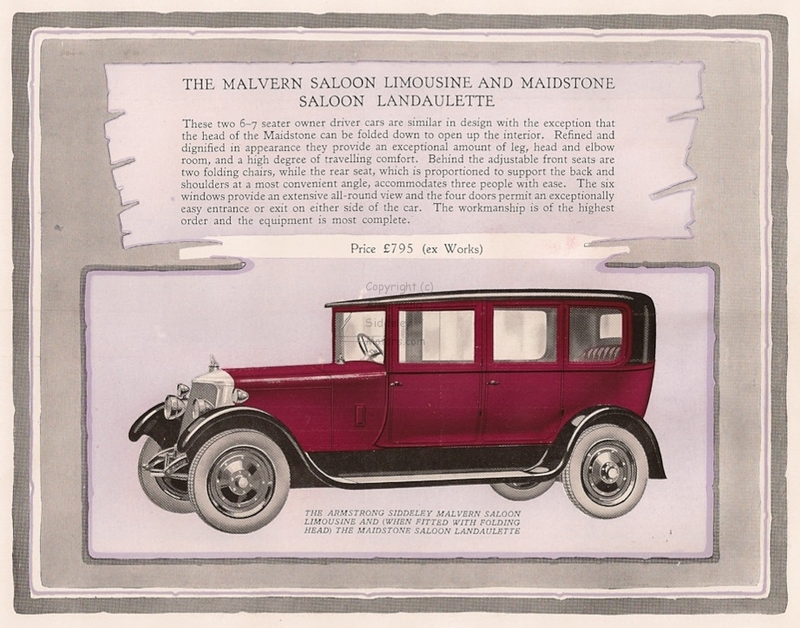 This is the same 18 HP car with the more expensive Malvern Saloon Limousine and Maidstone Saloon Landaulette body. The landaulette body had an opening hood at the rear, but otherwise was the same as the saloon. 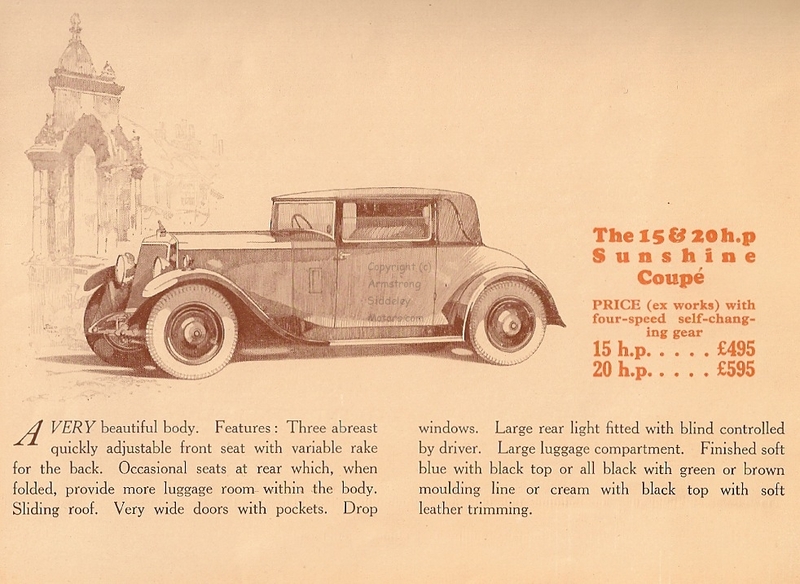 The 18 HP, or Short 18, was offered in 1926 in a wider range of body styles than the Long 18. 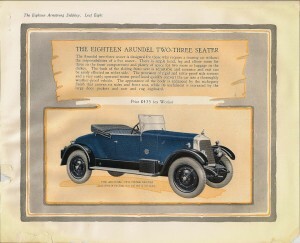 This included two Coupe bodies: the Arundel 2/3 seater and the more expensive Harlech Coupe. There were also two tourer bodies: the Taunton Open Tourer and the Braemar Special Tourer. The saloon bodies were Stirling Saloon, Eaton Special Saloon, Conway Saloon Landaulette, and Carlisle Three-quarter Landaulette. I show some of these below. This period photographs shows an 18 HP Armstrong Siddeley parked near to Coppull Ring spinning mill built in 1906 in Coppull, near Chorley, Lancashire, UK. The car has bumpers added as an extra, and it looks as if the owner has scraped the edge of the wings. 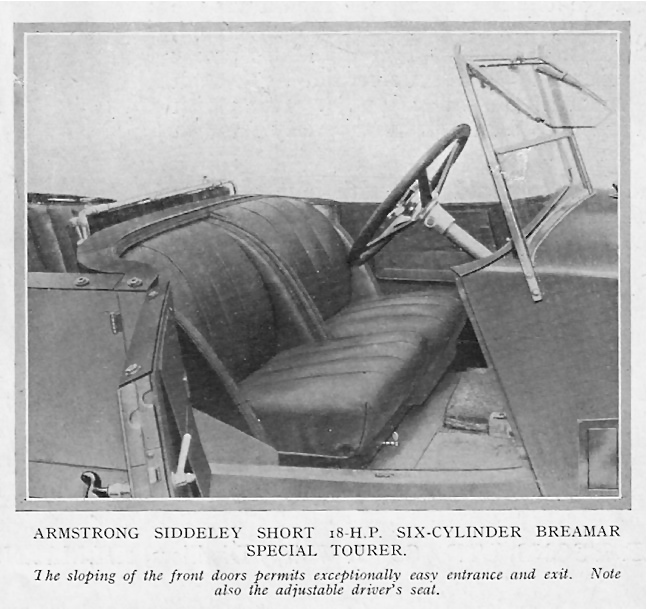 Driver’s view of the 18 HP Armstrong Siddeley. This is from the handbook for the Short 18 HP car dating from around 1926. 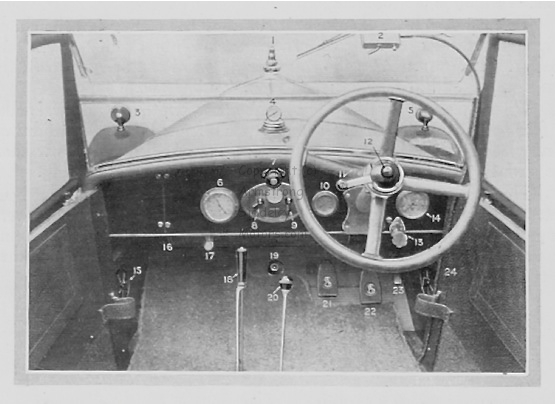 The controls are 1 Sphinx radiator cap, 2 Windscreen wiper operated by cable driven from the gearbox, 3 and 5 Side lamps, 4 Petrol gauge, 6 Clock, 7 Dashboard lamp, 8 and 9 Electric switches, 10 Oil gauge, 11 Ignition control, 12 Horn button, 13 Throttle control, 14 Speedometer, 15 and 24 Scuttle ventilators, 16 Petrol tap, 17 Choke, 18 Brake lever, 19 Starter button, 20 Gear lever, 21 Clutch pedal, 22 Brake pedal, 23 Accelerator pedal. 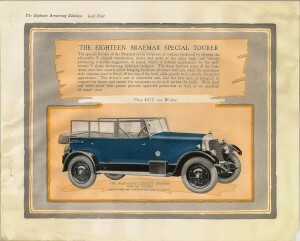 The Braemar tourer had separate front seats allowing for adjustment of the driver’s seat, which was not possible on the cars fitted with a single bench seat. This photograph of a Short – 18 HP was published in June 1926. By 1928 the model was called the 20 HP. 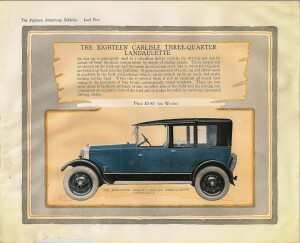 This catalogue image shows the open tourer body which for 1929 had higher sides and a slightly more streamlined feel with the raised body line behind the sloping windscreen. The image is from a catalogue issued in 1928, showing the 1929 range of cars. In 1929 Armstrong Siddeley first offered the pre-selector gear box as an extra at a cost for the 20 HP of an additional £35. The Fabric Saloon was covered, as the name implies, with fabric. This made the body lighter and quieter. A similar design was available on the Short 20 HP, 15 HP and 14 HP models. By the mid 1920s saloons were out-selling tourers. 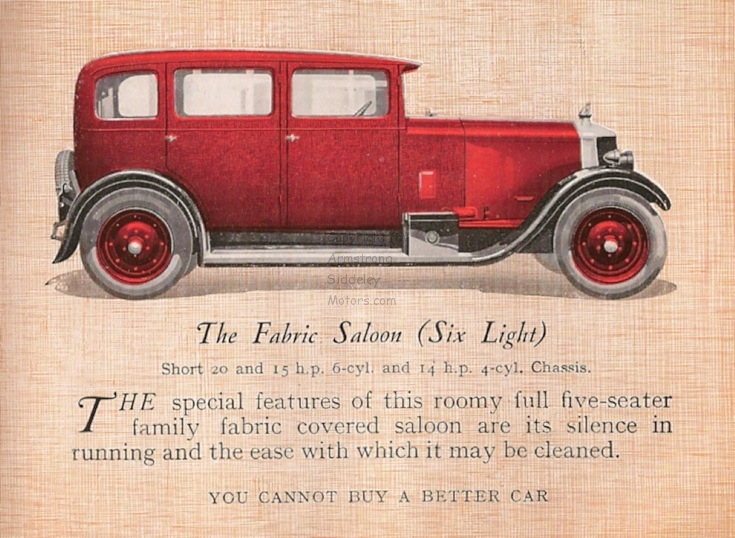 The catalogue for 1931 showed the Sunshine Coupe body which was available on the 20 HP and 15 HP chassis. 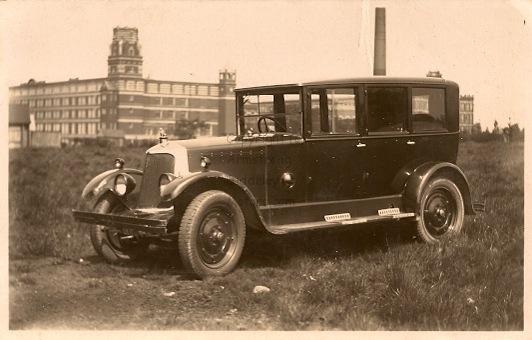 Hi, Please could you identify the body type of the car shown in the picture “Armstrong Siddeley 18 HP at Coppull Mill, Lancashire” as the car I purchased in 2010 in New Zealand advertised as a 1924 18HP ( I think actually a 1927, car number 42286) is identicle to the one in the picture. It still has what I believe to be English registration plates “Y 63 0”. I think this is the Eaton Special Saloon body, assuming the body on your car is a saloon. If it is a landaulette, it is the Conway Saloon Landaulette. Let me know if you would like me to send you more catalogue images of the 18 HP saloon models. Sorry for a delay in our reply but we have only spotted your reply today. I would be pleased for any assistance and pictures especially of the interior as the car has no interior trim or seats. My email is gibney@clear.net.nz. Hi. 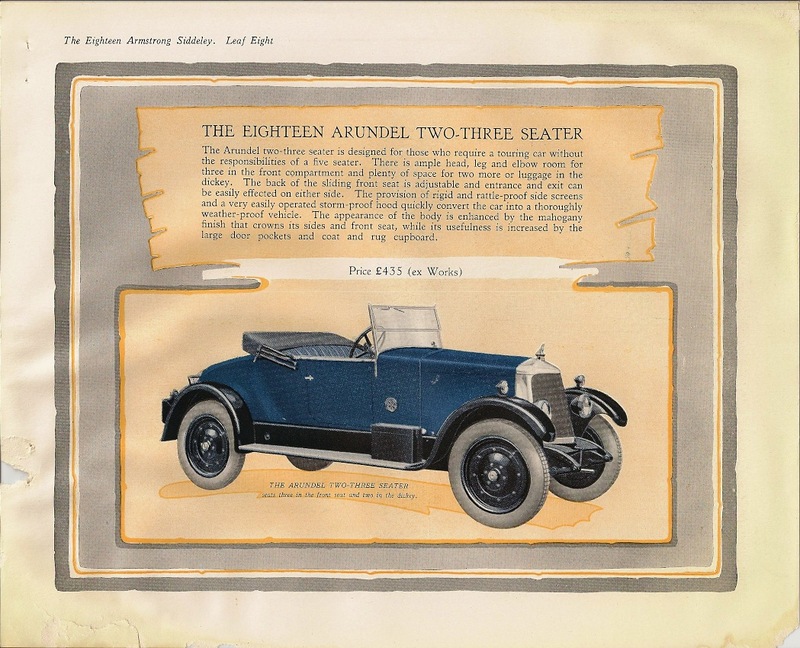 I just happen to stumble upon this page and noticed the comment cocerning the 1924 or maybe 1927 18 HP Armstrong Siddeley purchased in NZ 2010. My wife owned a 1927 18 HP Armstrong Siddeley saloon and sold it in NZ in about 1998 and at a guess it’s the same car. Dark blue in colour, originated from Eltham. I met the Birchlers who were the original owners, It was resored in Wanganui by Arthur Evans and my wife bought it in about 1978 and it was used regularly on the road where we lived in Taranaki and she sold it to Chris someone in Christchurch. It was sold as a rolling chassis only and the body was built in Christchurch.